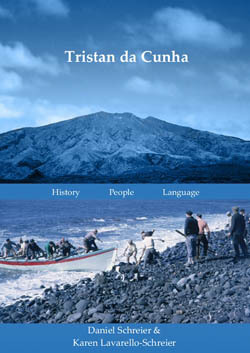 Details of books and other publications about Tristan da Cunha published from 2003 to 2005.. The book provides a well illustrated, absorbing account of Gough’s remarkable plants and animals and a good history of its discovery and exploration. The authors have a combined experience of remote Southern Ocean islands and the conservation of their environments which lends considerable weight to their writing. 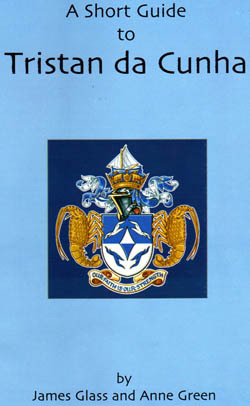 It is a pleasure to read of the series of colourful events that have made up the island’s history, the details of the island’s current management and to also find for example the first published account of the deaths of members of the South African meteorological station in two separate incidents on the island which grabbed the world’s headlines. Published by Sun Press 2005. 169pp, colour illustrated with 10 appendices. ISBN: 1-920109-03-X Price: R285.00 Postage: R25 in RSA, R150 international from www.africansunmedia.co.za or Miles Apart @ £30 inc. P&P ex UK. Tristanians have long been sensitive about how outsiders portray their community so Rockhopper Copper is of considerable interest to all who follow events on these remote islands. Conrad Glass is one of the most well known faces from Tristan da Cunha having featured in several films and, being the island’s only policeman, is one of the first islanders most visitors see prior to disembarkation. “The Rockhopper Penguin is a most disagreeable bird and was always ready to have a go at his neighbour, the world and myself in general. Almost all could be held on a charge of Breach of the Peace”. With this sentence the author cleverly combines his two main interests – policing and the natural world and thus derives a memorable title for his book. In sixteen chapters we are given accounts of many aspects of island life that outsiders have found so intriguing – the 1961 eruption and its effects on the islanders, stories of ships and the sea, visits to other islands in the archipelago and the 2001 hurricane. In the chapter Personal Glimpses Conrad describes the fatalistic nature of the community and how belief in the Will of God has allowed them to cope with sometimes overwhelming difficulties brought about by extreme isolation. Writing about small communities is a sensitive business and Conrad is outspoken in his criticism of past authors who have portrayed individuals or the community as a whole in an unfavourable light. It is surprising to find that words written before the war in a different age are still remembered and continue to cause offence. Rockhopper Copper should not be absent from the shelves of anyone with anything more than a passing interest in the world’s remotest island . This book is not a biography and contains little personal information, instead we are given amusing accounts of his years in these three very different territories all facing great changes at the time of the author’s presence. Roger Perry ’s background is in conservation so there are plenty of accounts of birds, wildlife and plants but he doesn't’t take himself or his discipline too seriously. The description of the Tristan community is written with affection and wit. Surely sensitive islanders will not mind being written about in this fashion. Although much is printed about Tristan surprisingly very little gets written about the day to day life of the community and its concerns by anyone who has actually lived on the island. Perry writes sensitively about the islander’s extreme conservatism and his disagreements with them over difficult conservation issues such as the “fatting” trips to Nightingale. To one of Perry’s background the mass slaughter of birds for so little gain was repugnant but he is sufficiently broad minded to see the trips as an essential part of island life extending far beyond the acquisition of a few gallons of oil and something that would change with time and education rather than with confrontation. A good read, sensitive descriptions of Tristan and a book that might encourage those with hearts set in the South Atlantic to explore some of the delights of the Pacific as well. 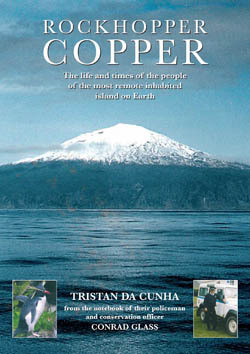 As its title implies, this book is about the 1942 naval and military occupation of Tristan da Cunha , a little-known war-time operation code-named Job 9 whose purpose was to establish a listening post for detecting enemy raiders and submarines in the South Atlantic, and also set up a meteorological station to radio weather reports to South Africa. The account of Job 9 is important and of great interest as a record of a virtually unknown operation of the Second World War. Moreover, the story includes a lively description of the part played by Tristan Islanders themselves, sixteen of whom formed the Tristan Defence Volunteers. A ‘Dad’s Army’ ? Maybe, but they were in earnest and full of enthusiasm, and with their rifles and hand grenades fully prepared to repel any possible German or Japanese invasion. 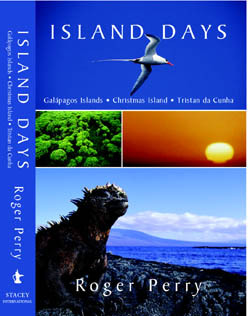 The book is also a fascinating account of how, in the 1940s, the Tristan Islanders lived and worked, their social relations, how they regulated their affairs in the absence of laws, how they co-operated for tasks like boat-building, thatching or spinning (which one person alone could not do), and how they actually carried out such tasks. There is probably nobody with a greater insight than Allan Crawford into the 1940s ways and lives of the Tristan people, and who could set out so exactly how their houses, boats and ox-carts were constructed, how their spinning wheels were made and operated, how their subsistence farming was organised – and much more. All this comes across, not as a dry and impersonal sociological study but rather as the author telling us, with copious illustrations, about the lives and ways of his friends. 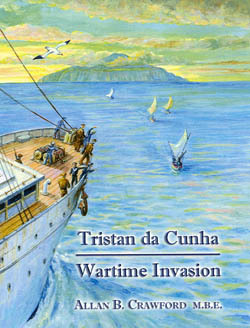 Tristan da Cunha - Wartime Invasion was published by George Mann in 2004 , has 160 pages illustrated, and is available from Miles Apart for £11 including P&P ex UK. The book is highly acclaimed on the island, more especially as it arose through the partnership between Daniel and islander Karen , who met whilst he was conducting his ethnographic and sociolinguistic fieldwork on Tristan between January and June 1999. Their joint efforts have enabled them to put together a book which combines a welcome new study of the Tristan language with a good general history and portrait of the modern community through the eyes of an islander. In 1999 Daniel was working in his second Swiss university appointment in Fribourg. 55 Tristanians agreed to taped talks with him during his visit and, with Karen ’s insider knowledge, and contributions from other islanders, the resulting book is refreshingly authentic. 'This book does our island justice for once. Captivating and scholarly, it gives the wider public the opportunity to understand - and get a feeling of what life is like on the world's most isolated inhabited island.' James Glass Chief Islander 2003. Published by Battlebridge in 2003, 88 pages illustrated and available from Miles Apart for £11 inc P&P ex UK. Profits from book sales are going directly to help repair the 2001 hurricane damage. 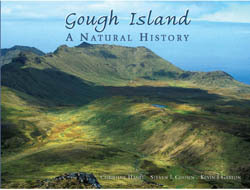 The brother and sister team of James Glass and Anne Green bring an authority to this first book produced by Islanders. James served as Chief Islander for three terms between 1994 and 2003 and Anne for two terms between 1988-1991 and 2003-2007. James Glass is Head of the Agriculture and Natural Resources Department and Anne Green is Deputy Head of St Mary's School. Both live on the island with their families and are members of the Island Council. This book, with its mine of information, provides both a useful introduction and a well illustrated keepsake after any visit (to the island); it is therefore both welcome and commended. This guide of 12 pages with colour illustrations is available from Miles Apart for £4 including P&P ex UK, and from the island.It was published by the authors and printed by the Whitby Press in 2003.